Burkina Faso's ousted leader Blaise Compaore has been granted Ivorian citizenship, effectively ending the prospect of his extradition to face murder charges back home. The order was signed by Ivorian President Alassane Ouattara in November 2014, but has only just come to light. Mr Compaore is wanted over his alleged role in the murder of iconic ex-leader Thomas Sankara in 1987. His 27-year rule ended in October 2014 after a wave of popular protests. Mr Compaore, whose wife is Ivorian, has been in exile in Ivory Coast since his overthrow in October 2014. An international arrest warrant was issued for him in December. The BBC's Valerie Bony in Abidjan says Ivory Coast does not extradite its citizens. Mr Sankara, a left-wing radical seen as "Africa's Che Guevara", is considered a hero for many Africans and was succeeded by Mr Compaore, who had served as his deputy. 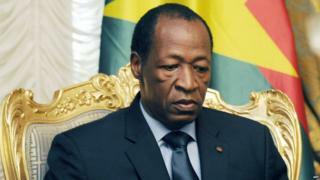 The exact circumstances of his death have remained a mystery, but Mr Compaore has always denied any involvement. An autopsy last year on the supposed remains of Mr Sankara revealed the body was "riddled with bullets", though DNA testing was unable to confirm the identity. There have been conflicting reactions from members of Burkina Faso's civil society to Mr Compaore's perceived attempt to block his extradition by adopting a new nationality. Ismael Diallo told the BBC he felt it was shameful move as the former president wanted "to be out of reach from his country's justice system". But Pascal Zaida felt Mr Compaore was right not to return until he could be guaranteed a fair process in a country where the "victors' justice has prevailed during the transition and that is continuing even today". Burkina Faso held successful elections in November, two months after a short-lived coup by a unit of the country's presidential guards. What was behind the coup in Burkina Faso?